so we are officially in the "it's too hot and i have nothing to wear" phase of summer. what to do? what to wear? 2. stick to natural, breathable fabrics. i find that as temperatures climb, i live in easy silhouettes like this everlane breezy silk tank dress or a simple summer LBD – nothing beats a one-piece outfit that still manages to look put-together. best of all, the accessories options span from barely-there hints of gold to all-out statement. side note: since i got them earlier this month, i've been slightly obsessed with the cushiony comfort and surprisingly versatile style of my Nike roshes. if you're on the hunt for a pair of ultra lightweight/very breathable minimal sneakers, you can't go wrong with the flyknit version in a neutral grey. sizing runs TTS (thankfully these do not run small like most Nikes do), and as far as sneakers go, they are very flattering and as 'chic' as they come. how is your summer coming along? what is your hot-weather style M.O.? Great advice on a very steamy day in NYC! Already said it but I love this outfit! I usually find that tank dresses are too tight but this one seems a bit loose and the length is great. 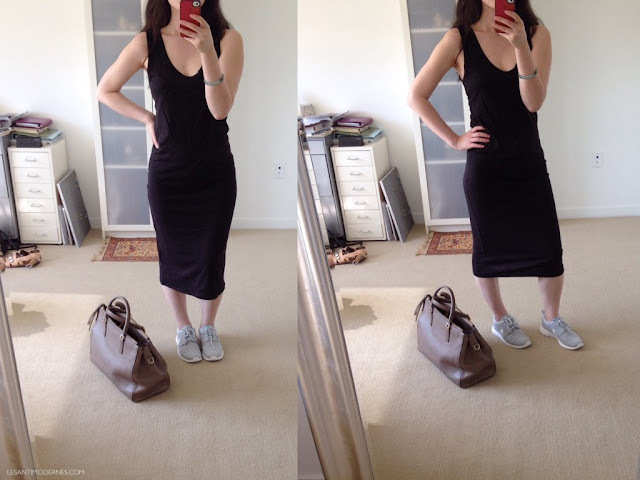 So far my hot weather style revolves around loose dresses, linen or cotton materials, straw hat and sandals mostly! It's even steamy out in Montauk, and that rarely happens! I'm wearing knee length t-dresses...some sleeveless and some short-sleeved, along with my gladiator sandals. I love the Nike's with your dress, but I don't even want my feet covered in the heat! I have found my signature summer cut (for up top at least) - it is in the form of Everlane's The Sleeveless shirt. it is just a) work appropriate b) flattering for someone who hates their arms/shoulder in sleeveless tops. I learned the thinner the straps the more off I look. so this is a perfect balance of cooling + a v-neck to keep things not so constricted. I just "invested" in a silk version which is my first Everlane silk and I'm really impressed. I'm not sure how I would deal wearing it on a super hot day because I do get really sweaty as a commuter! to be honest, I'm really looking forward to wearing pants again. yes! i am all about the sleeveless in the summer months :) FYI many readers have had no issues washing/handwashing their everlane silks, so i think you should be good to get more wear out of your silk shirt too! Dresses always, when it gets really really hot. Funny, i've been loving a basic stretchy tank dress as well. i like it best when they're knee-length - you can add a belt and it looks a little more polished, for the times you need to clean up a little. Shoes-wise, I'm still in love with my TOMS, when I'm not in my Dieppa Calis for work. co-sign on the TOMS love. you wear yours so well with your workweek essentials! Love that dress! On rare instances where I can't wear denim cutoffs I find Rick Owens jersey pieces to be very cooling.